Scientists have used DNA testing to confirm that two recently discovered bodies were the missing Romanovs. Now all seven members of the family of Tsar Nicholas II have been identified. None escaped the family's execution in 1918. All of this taken together provides very strong evidence that the occupants of the two graves were the Tsar, the Tsarina, and their five children. Mystery solved. MtDNA is used in these sorts of historical studies because it changes little from generation to generation and because there is so much of it. Instead of the usual two copies per cell, there can be thousands of copies of mtDNA. This makes studying it much simpler. 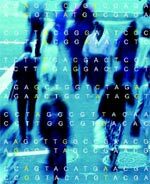 Because mtDNA passes unchanged from mother to children, it can be used to quickly identify who is related to whom in one line on mom's side of the family. In this case, six of the seven people shared mtDNA with each other. The adult male did not. This is what is expected from a family. The mom and her children will share the same mtDNA. Dad will have his mom's mtDNA. MtDNA can also be used to find more distantly related people. For example, the Duke of Fife and Princess Xenia Cheremeteff Sfiri were related to Tsar Nichols II through his mother. The adult male in the grave and these two royals share the exact same mtDNA. This definitely links the male to Tsar Nicholas II. The children and the adult woman all share mtDNA with HRH Prince Phillip. The Tsarina was related to Prince Phillip through her mother. So the female was of the Tsarina's family and the male was of the Tsar's family. Of course, this does not prove that this is the Tsar and Tsarina. Because mtDNA doesn't change much generation to generation, a lot of people can share the same mtDNA. The researchers searched a number of mtDNA databases and could find no matches for the mtDNA from the grave. This suggests that the mtDNA of the Tsar and Tsarina's families is not all that common. Even if their mtDNA was fairly common, the circumstantial evidence would still be very strong for the occupants of the graves being the Tsar and his family. If not, then the father would have to be related to the Tsar and the mother to Tsarina. And they would have had to have had four daughters and one son. And to have been killed together execution style in the right place at the right time. Y Chromosome The researchers also compared the Y chromosomes of the man from the first grave to the boy in the second. They matched perfectly. 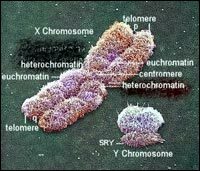 The Y chromosome is like mtDNA in that it passes from generation to generation virtually unchanged. But unlike mtDNA, the Y chromosome passes from father to sons. The fact that the man and the boy share the same Y chromosome tells us that they are both related by a common male ancestor. The simplest possibility is that they are father and son. But they technically could be uncle and nephew or even more distantly related. The researchers compared this Y chromosome to a known distant cousin of Tsar Nicholas II. The two matched. So the man and the boy were related to Tsar Nicholas II through a paternal line. Autosomal DNA Autosomal DNA just means all of the DNA that isn't mtDNA, Y or X chromosome. In other words, it is the other 22 pairs of chromosomes. These are the chromosomes that can change from generation to generation. But they can still be useful to study if scientists just look at small parts of them. The researchers essentially used this DNA to do a paternity test on the family. The results were that the odds of the man and the woman being the parents and the five children being theirs was around 4.36 trillion to 1. This strongly indicates that the seven bodies were all members of the same family. The Evidence: A Summary Two separate graves were found within 75 yards of each other. The graves contained a total of eleven bodies. DNA and anatomical evidence indicated that there were four female children, one male child, four men and two women. This was the composition of the Tsar's family and servants who were exiled together. DNA evidence showed that seven of these people were related -- the man, the woman, the four girls and the one boy. Again, this was the composition of the Tsar's family that went into exile. DNA evidence also showed that the man was related to the family of Tsar Nicholas II on both the mother's and the father's side of the family. And that the woman was related to the Tsarina on the mother's side of the family. the father's side of the family.